Men's Club Lacrosse hosted their first games of the 2017-2018 season at Shuart Stadium on Sunday, September 24th against Monmouth and Quinnipiac. The Pride split the day, winning their game against Monmouth by a score of 4-3, behind 2 goals from graduate student Martin Beer, and falling to Quinnipiac by a score of 8-4. Women's Club Rugby hosted Binghamton University on Sunday, September 24th. Showing marked improvement from their previous two games, the Pride were finally able to get on the scoreboard with tries from Lili Hinojos-Madrid, Taryn LaSmith and Leah Bodh. The Pride ultimately fell to the Bearcats by a score of 90-20. Men's Rugby traveled to Troy, New York on Saturday, September 23rd to take on Rensselear Polytechnic Institute (RPI) in their first game of the season. RPI quickly jumped out to a 10-0 lead, but a try from Hofstra’s Josh Beck cut the lead to 10-5. However, RPI responded with a try and successful conversion kick to take a 17-5 lead into the half. Jeremey Tabansi opened the 2nd half scoring for the Pride with a try to trim the RPI lead to 17-10. RPI extended their lead to 29-10, and despite a late try from Hofstra’s Matthew Murawski, the Pride ultimately would fall by a score of 29-15. Club Baseball took on Fordham University at Wantagh Park in a non-conference game on Saturday, September 23rd. Behind solid pitching performances from Stephen Locorriere and Steve Pekarik, the Pride claimed their first victory of the fall season on a Tom Murca walk-off double to win the opener by a score of 4-3. Fordham would come back with a vengeance in the second game and beat the Pride by a score of 10-3.
scores of 12-6, 9-1, and 8-4. Men's Club Soccer traveled to Murphy Field on the campus of Fordham University in the Bronx, NY on Friday, September 22nd to take on the Rams. The Pride fell to the Rams by a score of 6-0. Hofstra was back in action in New Jersey to take on Seton Hall University on Saturday, September 23rd. Nicolas Saint Remy and TJ Behari both scored for the Pride as they played the Pirates to a 2-2 draw. Rock Climbing Club traveled to Brooklyn Boulders Queensbridge for the second climb of the semester on Saturday, September 23rd. The team livestreamed parts of their climbed which can be seen at this link. Billiards Club had their weekly match at Raxx Pool Hall on Sunday, September 24th in West Hempstead, NY. Kevin Gomes came away with a win, and the team claimed an 8-5 victory. 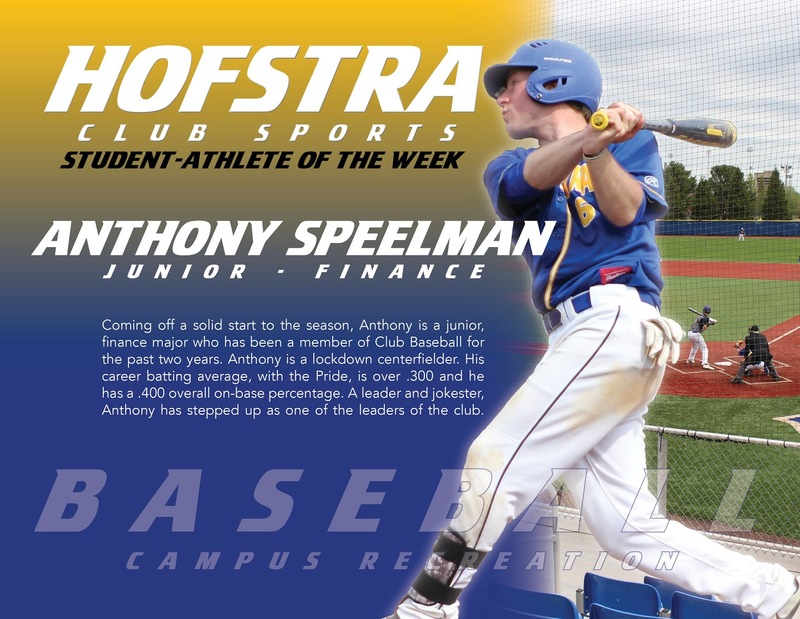 A lockdown defensive centerfielder, Anthony has also been an OBP machine for the Pride at the top of their lineup. In the team’s opening doubleheader against UConn, Speelman reached base in 6 of his 7 plate appearances. Since joining the Pride, Speelman’s batting average is over .300 and his on-base percentage is over .400. Congratulations to Anthony!